Islander’s shark cage dives are all-inclusive. That means four-star meals, snacks, all beverages (including beer and wine when done diving for the day), air-conditioned stateroom accommodations, Guadalupe Island biosphere permits, Mexican tourist visas, customs fees, taxes, masks, wetsuits, regulators, weight system and of course a very experienced, friendly and helpful crew are all included. What sets Islander Charters apart from other Great White expeditions to Guadalupe Island? We have a 100% success record and a 100% safety record diving with Great White Sharks. Additionally Islander Charters is the whole package: we have the most experienced crew, a world renowned divemaster, we own and operate our own boat as well as using our own custom welded non-collapsible shark cages. This allows us to guarantee every aspect of your trip. See our media page which includes links to various Shark Week shows, articles and documentaries. There is a reason the experts (researchers, marine biologists and film makers) want to come with us! Yes, despite what you see on some sensationalized TV programs, Great White Sharks are very cautious and graceful animals. We do not encourage sharks to bite cages or crash into cages doing harm to their teeth and endangering divers. Our crew is the most experienced in the business and passenger safety is our number one priority. We have a perfect safety record which means no cage breaches, accidents or incidents between divers and Great White Sharks. No. Although scuba diving experience is a plus, it’s not required. Our two main cages are attached to the rear of the boat and you step from the boat into the cage. The water surface is only about 4 feet above your head and air is surface supplied via hookah hose. If you have never breathed through a regulator, our dive instructor will work with you and patiently evaluate your comfort level in the water. Since you do not have tanks on your back and are not diving at a great depth, you do not need certification. If you are still uncomfortable breathing from a regulator, you will still be able to clearly view White Sharks from the boat deck topside. Be sure to bring polarized lens sunglasses! To participate in the submersible cage, SCUBA certification is required. Please bring your certification card and our divemaster will give you a refresher course on board. Each submersible dive is two people in the cage: our divemaster and our guest diver. Most White Sharks at Guadalupe Island range from 10-16 feet long. Although large, it’s not the length of the animals that awes most first timers, it’s their girth. When you see them up close and personal, they are all big. How reliable is Great White Shark viewing at Guadalupe Island? Extremely reliable. We have a 100% success rate. We normally encounter multiple White Sharks each day. Our record is nine different animals circling the boat at the same time! In fact, we guarantee White Sharks or your next trip is free. How clear is the water at Guadalupe Island? Very clear. 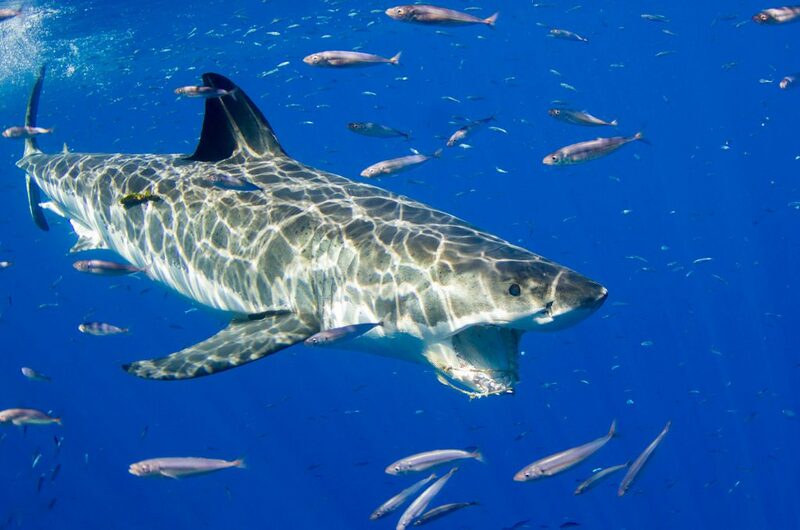 Unlike shark diving in South Africa’s murky water, Guadalupe Island boasts visibility of over 100 feet. On average, you can expect 80-120 foot visibility. The clear water is the main reason Guadalupe Island has become the world’s premier White Shark diving location. How cold is the water at Guadalupe Island? The water temperature at Guadalupe Island ranges from 65-75 degrees Fahrenheit. We suggest diving with 5mm – 7mm wetsuit with a hood. The water is comfortable but since you are primarily stationary in the cage (not swimming) and taking multiple dives each day, it feels colder than you think. Our advice for staying warm is to not get cold in the first place! Wetsuits provided by Islander Charters are 7mm. How long does it take to get to Guadalupe Island? Travel time is approximately 23 hours. It is a long journey but well worth it! Although the sharks are the focus of the trip, you will often see a variety of other sea life while en route and at the island. Is there anything to do on the boat while travelling to Guadalupe Island? Yes, we have a fully stocked DVD library with many informative Great White Shark documentaries and popular movies. Still to this day, Jaws is usually the first one people play! In addition, we have a book identifying all the sharks we’ve seen at Guadalupe by name, along with other books, games and magazines. Many divers watch for whales, dolphin and other marine life that we commonly encounter in transit to and from Guadalupe Island. Sleeping quarters onboard Islander are stateroom style with 2-3 berths per room, similar to most liveaboards. Each room is air-conditioned with a sink, mirror, 110v outlets and storage for clothing. All doors can be secured from inside. Berths have pillows, full linens including a fitted sheet, top sheet and comforter. Should I pack my own snacks or beverages? You will not go hungry on this dive trip! Hearty four star meals are served three times daily. Meals range from California tri-tips to fresh fish dishes. Fresh bread is baked and served each night. Additionally, a mid-morning snack and afternoon appetizers are prepared each day. Fresh fruit & other snacks can be grabbed from the galley anytime. Soft drinks, teas, hot cocoa and coffee are available from the beverage bar around the clock. House beer and wine are included once you have finished diving for the day. If you have dietary restrictions or a special request, please make a note of it in the area on the questionnaire. The voyage aboard Islander is a nearly 200 mile open ocean crossing. Although the boat was designed and built specifically for the waters of Baja California, you will feel the motion of the ocean. If you are prone to motion sickness, you will want to take preventative measures. Dramamine, behind- the-ear patch or other over the counter drugs work well for most people if used at least two hours prior to departure. Please note these methods are preventative and will not work once seasick. Islander Charters recommends speaking to your doctor or pharmacist to discuss interactions with any other medication you may be taking. Once anchored at the island, seasickness will subside. Do I tip the crew, and if so, how much? It is customary for live-aboard divers to leave a gratuity upon departure for a job well done. 10-15% is average for most trips. Will there be internet or cell phone service? No, you are definitely off the grid on this trip! The island itself is uninhabited with the exception of a few researchers and Mexican fisherman who live off generators. We have a satellite phone aboard the boat for emergencies and quick calls to check in. The cost for usage is $2 per minute. The captain always has radio communication with our landing and the U.S. Coast Guard for emergency service. Once you board the boat, you do not disembark until the trip returns from Guadalupe Island. Here is a comprehensive list. Temperatures at Guadalupe Island can vary greatly throughout the day. Mornings and evenings can be cool, in the low to mid-60s, while midday can reach highs in the 80s. The earlier in the fall your trip is, the warmer the weather will likely be. Layers are the best way to deal with wide ranging temperatures. A light jacket, hoodie or lined windbreaker will be helpful if a breeze picks up. You might want to bring a couple pairs of long pants for the cooler evenings, especially after being in the water all day. Dress is very informal aboard the boat. Most everyone will be in t-shirts, shorts and flip flops. Water temperatures at Guadalupe range from 64 to 75 degrees in the fall. If you are bringing your own wetsuit, we recommend 5mm-7mm with hood, booties and gloves. Rental wetsuits are included in the price. They are 7mm one piece suits that zip up the back. Hoods, booties and gloves are also provided but many divers go without these. Weight systems are harness type with up to 40 pounds of weight so divers are negatively buoyant and are able to walk around in the cage as if they are on land. Regulators are standard second stages and air is surface supplied. SCUBA certified passengers using the submersible cage will have air supplied from a tank in the cage. Islander Charters recommends you bring your own mask to ensure a perfect fit. Although we provide quality masks, we cannot emphasize enough the importance of having a mask that properly fits your individual face. Don’t forget this most important item! Capture the sharks and your memories with an underwater camera. There is a large variety on the market today. Many of our passengers bring GoPros for great action shots but Amazon and other outlets sell quality underwater cameras for much less. Most people bring their laptops and flash drive to share photos during the down time. Another diver might get the best shot of you with a Great White and vice versa. Everyone develops a sense of camaraderie as you bond in the galley salon each evening and during travel.